In a recent conversation with a prominent nurse leader, the topic of vital behavior came up. If you’re not familiar with the term, a vital behavior is the smallest action you can take to bring about a desired result – one little change that can create a hugely positive outcome. In this case, the vital behavior we were talking about was patient ambulation. That is: if caregivers could simply walk their patients as often as they should, the result would be enormously beneficial for patients, staff and hospitals. In fact, we’ll go so far as to say that a successful program of early, frequent and persistent patient ambulation offers the greatest opportunity to improve patient care and lower costs. We also believe that hospitals that recognize the magnitude of this opportunity, and act on it, will be in the best position for future success. The clinical leader we were chatting with, a seasoned pro in the midst of a large-scale implementation of the IVEA, agrees that the opportunity around ambulation is exceptional, but she also realizes that adopting a new behavior – however effective – is hard to do. Who among us hasn’t decided to go on a diet and failed miserably? Who’s vowed to stick to a budget then found themselves charging a must-have pair of shoes? It’s human nature to hold on to the status quo, even when it doesn’t serve us. That’s why lasting, positive change takes more than a directive. For a vital behavior to work, you need the right tools, the right process and the right motivation. 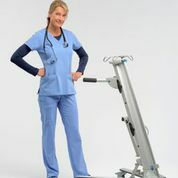 When it comes to better ambulation, the IVEA is absolutely the right tool – a stable platform that holds the patient’s equipment, eliminates tripping hazards and promotes good posture and a natural gait. The process – keeping the loaded IVEA bedside to eliminate set-up time for ambulation and reduce the number of caregivers need to ambulate – is simple and intuitive. And the motivation? Well, that can come in many forms. This leader told us that in some cases she’s been able to motivate staff to change by making it about the patients. “I understand that they’re used to doing things a certain way, but if I can get them to consider how much the patients appreciate and prefer the IVEA, that might help them make that small change,” she said. When you consider all the ways the IVEA can benefit patients and staff and reduce costs, motivation should be easy to come by. Is it better patient safety? Better caregiver safety? Shorter lengths of stay? Fewer hospital-acquired conditions? Improved patient satisfaction? What would motivate your team to adopt the vital behavior of ambulating patients to orders using the IVEA? A vital behavior is the small action that delivers big results. The IVEA is equipment that makes that action possible. Contact us today to change behavior around ambulation at your hospital and take advantage of the biggest opportunity in patient care today. (970) 472-5323; info@iveamobility.com.